Frederik Willem De Klerk served as president of SOUTH AFRICA from 1989 to 1994. He was the driving force behind government efforts to end the country’s official system of race discrimination known as APARTHEID. De Klerk was raised in a political environment. His father was a cabinet minister who served as president of South Africa’s senate. 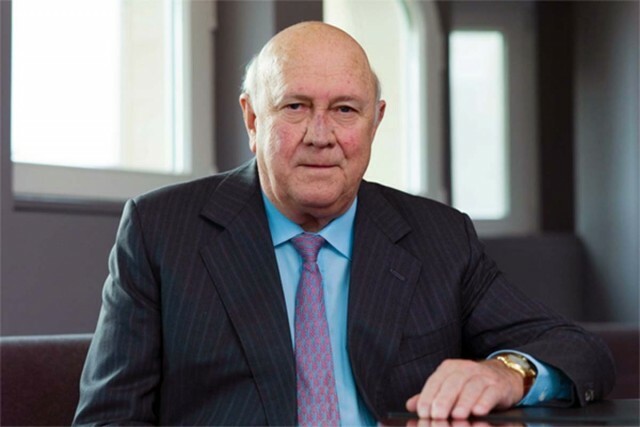 After graduating from university, De Klerk became an attorney and was active in the National Party. In the early 1970s he was elected to Parliament twice, and later he held several cabinet posts in the national government. Early in his political career De Klerk supported traditional policies that limited the rights and freedoms of blacks in South Africa. However, he gradually changed his political views, and as president he introduced a new approach to dealing with the country’s racial conflicts. Instead of consulting the military on political matters as previous leaders had done, he sought advice from civilians. He also allowed peaceful demonstrations by opponents of apartheid. Soon after his election as president, De Klerk released eight members of the outlawed African National Congress (ANC) from prison. Over the next few months he began talks with the ANC, the South African Communist Party, and other political groups about the future of South Africa. One of his most important moves was to release Nelson MANDELA, who had spent more than 20 years in prison for opposing the apartheid regime. In the early 1990s, De Klerk represented the existing government at the Convention for a Democratic South Africa, a meeting that laid the groundwork for a postapartheid state. After stepping down as president in 1994, he took a position in the government of national unity that oversaw the country’s transition to full democracy. De Klerk boldly pushed through reforms leading to a new political order in South Africa in which the opportunities available to citizens would no longer be determined by their race. He did so even though he knew that he and his party would lose their immense political power as a result of his efforts. For his work in helping to end apartheid and grant full civil rights to South Africa’s black majority, De Klerk shared the 1993 Nobel Peace Prize with Nelson Mandela.